View sold computer systems is used to quickly find bill for sold configuration, or existing estimate. � Additionally, you can specify date period in which search will be performed. � 'From' and 'to' date option can be enabled by pressing the checkboxes near it. � If you check 'uncharged' checkbox, search will be performed only on outstanding bills. � When you press 'Search' button, the list below will show all systems matching your search criteria. � You can see your profit from sold computer system. 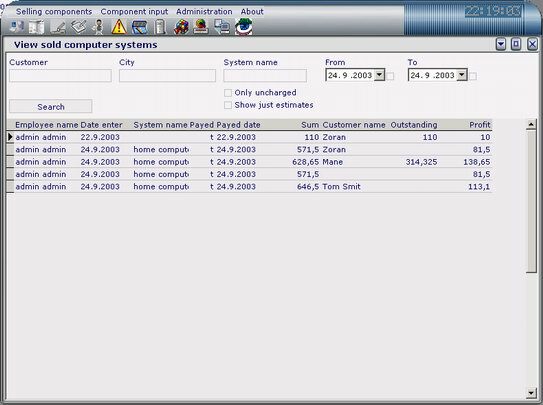 � To view complete information on specified system from list, just click on system in list, and sell computer system form will open. � If you used installments for selling computer system, you can see outstanding sum. � You can see and your profit from sold computer system. � There is another report, where you can see all sold components with/without bill IDs and date when component is sold.